Contrary to many media reports, hydraulic fracturing is not a “drilling process.” Hydraulic fracturing is used after the drilled hole is completed. Put simply, hydraulic fracturing is the use of fluid and material to create or restore small fractures in a formation in order to stimulate production from new and existing oil and gas wells. This creates paths that increase the rate at which fluids can be produced from the reservoir formations, in some cases by many hundreds of percent. The process includes steps to protect water supplies. To ensure that neither the fluid that will eventually be pumped through the well, nor the oil or gas that will eventually be collected, enters the water supply, steel surface or intermediate casings are inserted into the well to depths of between 1,000 and 4,000 feet. The space between these casing “strings” and the drilled hole (wellbore), called the annulus, is filled with cement. Once the cement has set, then the drilling continues from the bottom of the surface or intermediate cemented steel casing to the next depth. This process is repeated, using smaller steel casing each time, until the oil and gas-bearing reservoir is reached (generally 6,000 to 10,000 ft). The diagram shown below is a generalization of a typical Eagle Ford Shale gas well in south central Texas. A more detailed look at casing and its role in groundwater protection is available HERE. Source: Energy.gov Image taken from “Shale Gas: Applying Technology to Solve America’s Energy Challenges,” NETL, 2011. With these and other precautions taken, high volumes of fracturing fluids are pumped deep into the well at pressures sufficient to create or restore the small fractures in the reservoir rock needed to make production possible. What’s in Hydraulic Fracturing Fluid? Water and sand make up 98 to 99.5 percent of the fluid used in hydraulic fracturing. In addition, chemical additives are used. The exact formulation varies depending on the well. To view a chart of the chemicals most commonly used in hydraulic fracturing and for a more detailed discussion of this question, click HERE. 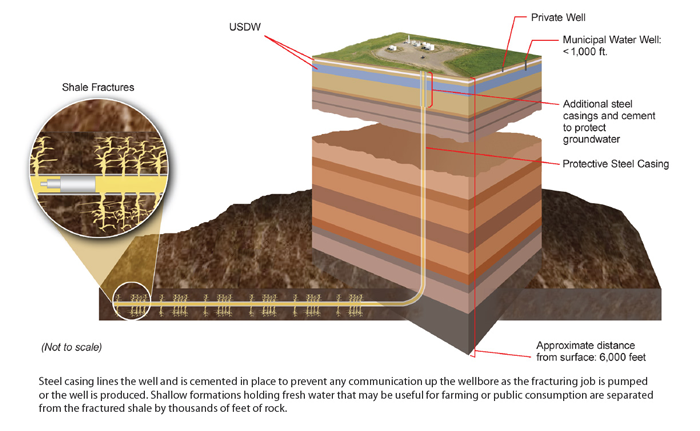 Why is Hydraulic Fracturing Used? Experts believe 60 to 80 percent of all wells drilled in the United States in the next ten years will require hydraulic fracturing to remain operating. Fracturing allows for extended production in older oil and natural gas fields. It also allows for the recovery of oil and natural gas from formations that geologists once believed were impossible to produce, such as tight shale formations in the areas shown on the map below. Hydraulic fracturing is also used to extend the life of older wells in mature oil and gas fields.